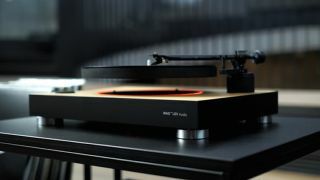 MAG-LEV Audio floating turntable raises almost £400,000 | What Hi-Fi? With five days still to go, the MAG-LEV levitating turntable looks set to go into production. Remember that MAG-LEV floating turntable that hit Kickstarter last month? You could hardly forget it, with its voodoo-like levitating skills and orange lighting underneath the platter. Well, it's smashed its fundraising goal, notching up a whopping $455,378 (over £366,000). And it still has five days left to go. It's absolutely demolished its $300,000 target. Which means all things being well, it should enter into production and become a reality, with the first backers receiving their magic turntables around August 2017. The platter hovers using magnets, with the system powered by the turntable's drive system. Not only does this look really cool, it should also minimise vibrations, making for better sound quality. That's the claim, at least. Turn it on, place your vinyl on the platter, and when you move the tonearm into position, the feet retract into the body of the turntable, leaving the platter suspended in air. Then just lower the needle, sit back and enjoy. While vinyl is playing, an orange ring of light appears underneath the platter, which certainly looks eye-catching if also a little like an oven hob. Power it down, and the feet come back up to hold the platter. The turntable comes with a pre-fitted tonearm and cartridge, and can play records at both 33.3 and 45rpm. The full retail price will be $1,390 (£1,119).